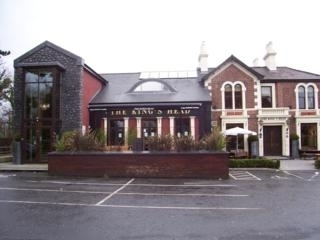 The Kings Head in south Belfast is found near the Kings Hall. Have you got Google Earth on your computer? If so, then download the Google Earth view of The Kings Head. Is this the wrong position for The Kings Head? If you think so, then modify its position. Click / Tap the button above to get directions from where you are to The Kings Head. have been a regular at the kngs head for years would hiighly recommend it to anyone who enjoys friedly surroundings and entertainment. many of my friends are also regularly with me on a saturday night have no complaints about servce, attidute or any member of staff. Bar staff particularly helpful at all times cheers to michael and susan and all the door men. on Mothers day my daughter and I dropped in for an evening meal, the restraunt was half empty however we were turned away after being asked how many were in our party and we stated only the two of us, not to mention i found the manageress of the restraunt to be extremely rude. and one of the girls that works there has a wonderful arse! We have had several great evenings in the Kings head restaurant. The food is excellent and service is good but sometimes a bit slow for drinks. It is a graet venue for the weekend as there are live bands playing in the Live Lounge. This saves a fortune for taxis as you have an all in one venue. Went here for food on a very quiet afternoon, Im a vegeterian and there was only on option on the menu which was horrible, i asked the waitress if the chef could make a pasta dish for me, she didnt even check with him, just said no so we had to leave.....fantastic customer care! I've been to the Kings Head on a number of occassions with wheelchair users and people with other physical disabilities. The staff in the Kings Head are so helpful and friendly and we always have a good night when we are there. Also, some of the bands are top notch. I particularly like 'The Big Cahuna' - first class! !